Provide comfort for the family of Robert Todd with a meaningful gesture of sympathy. Butch Todd was born on October 1, 1941 in Fremont, Nebraska to William Irl Todd and Ruby Waddington Todd. He joined his parents in Heaven April 12, 2019. 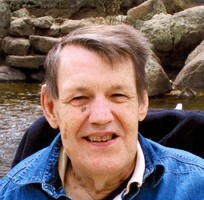 Butch suffered a birth injury and from that injury had cerebral palsy. He never developed speech except for a very few words, but over the years he did develop his own sign language. He also used the Sears, JC Penney’s and Wards catalogues when he needed to find a picture to let us know his wants and needs. He didn’t walk till he was seven. He had an infectious grin, a heart as big as Texas and love for the world around him. He remembered people he had meant years ago and would recognize them when they came to visit. I wish I had a dime for ever rock that he has thrown in rivers, streams and lakes from Nebraska to Alaska and for every Dr Pepper he drank over 77 years. Butch lived with his parents, Irl and Ruby Todd for 50 years during this time he attended several schools for the handicapped and for the past 10 years he lived with his sister, Nancy and her husband Duane. Butch suffered some life threating injuries during his life, but he survived and is our family’s hero. He touched and changed the lives of his brother, Gary and wife Linda and their children Terri Maass, Tad (Dorothy) Todd, and Scott (Karen) Todd. Also, his sister Nancy and husband Duane, and children Brad (Stacey) Bayne; Kerry (Andrea) Bayne, Kathi (Chris) Covelli and Kris Bayne. Butch was happiest when his nieces and nephews and his great nieces and nephew, were all together enjoying holidays, birthday and Christmas. He loved the commotion of the kids laughing, fighting, running and best of all the parents telling them to settle down. Christmas and birthdays, his and everyone else’s, were the events that always made for the brightest smiles. He was the greatest at blowing out candles, his and others, and unwrapping packages gave him such joy!! The great nieces and nephews left behind included: Anthony Bayne, Kristopher (Kayla) Bayne, Ashley (Chandler) Kost, Austen Bayne and his fiancé CiCi; Jace, Tyler and Chloe Covelli; Ty Peterson; Kyle (Stephanie) Maass, Charlotte and Claire; Kevin Maass; Kelsey Maass and Rex Rowland, Ryan and Tinley; William, Tj, Alec and Amanda Todd. We were all better people having know Butch Todd, he taught us all God lessons without even knowing. Compassion, unconditional love, hope in tomorrow, the childlike love of Christmas and birthdays. Joy in his Lawrence Welk DVD’s which we all know the words by heart. His simple love of a ride in his van to Sonic for lunch, Picnics and getting together with family and friends. Everyone should be so easily entertained and so thankful for the simple things in life. There is no greater gift than to love with the innocence of a child! We know for sure that there was glad reunion in Heaven when dad and mom were there to greet him, we also know that his affliction are healed, and his pain is gone. There is such healing joy in knowing the promise of that glad reunion with our loved ones in heaven. In addition to his loving family Butch leaves behind, his best friend, Art Summers and his loving caregiver Cathy Garcia. A Celebration Party of Butches life will be held at the home of Mr. & Mrs. Duane Bayne, 33115 CR 41, Greeley, CO 80631, Saturday, April 27th from 2-4 pm. Please come help us celebrate the way Butch would have wanted with bringing a wrapped package with baby items for the Pregnancy Center in Greeley Colorado. Burial will be at a later date in Neligh Nebraska where he will be laid to rest with his parents. To send flowers in memory of Robert Todd, please visit our Heartfelt Sympathies Store. Provide comfort for the family of Robert Todd by sending flowers. My sincere condolences to the family of Robert Todd. May you be comforted by your thoughts and memories of your loved one and God’s promise to “wipe out every tear from people’s eyes” and “make death go away forever” (Revelation 21:4). With deepest sympathy.